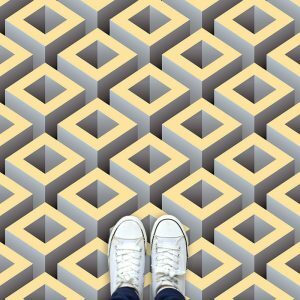 We recently curated and collected a number of new geometric designs primarily for the floor. 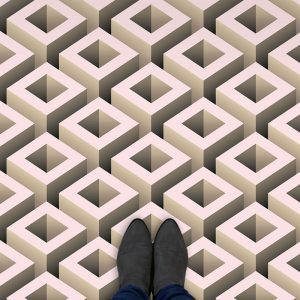 They are all in this post on ideas for 3D Vinyl Flooring. 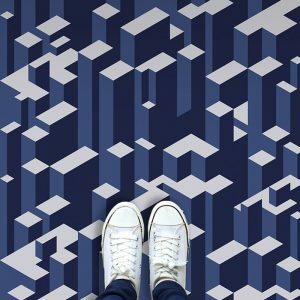 We love the way they play with depth and from floor level they appear abstract – a distinctive illusion toying with form and style. From eye level and above they become much more. Interweaving and interlocking links and shapes. Tetris type bricks cascading across the ground adding drama to the room. Designs created to force attention and conversation. For too long the floor has been the domain of plain. No longer is this viable. 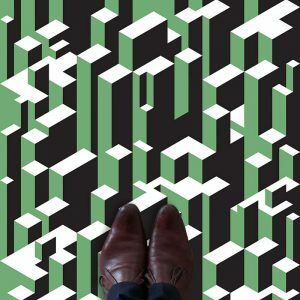 We create geometric patterns for wallpapers and glassware. Hung high and wide, they fulfil their desires with ease whilst splayed across the vertical surface. Floors have been left out of the sunlight and the spotlight. Pastel hues and minor pattern the most they have been afforded. A decorated rug tossed down as a final apology for dourness. We always wanted more but more was unavailable or at least not yet readily accessible. The internet created a possible solution but possibilities aren’t always clearly signposted. 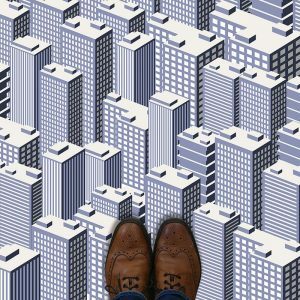 The flooring revolution had not yet begun. With the advent of digital print technology coupled with the new media advances bring, the snowball started rolling. Ideas for bold geometrics, colour potential unlimited, the designer’s brain ticking like a mind-bomb. Pantone tones like a new paintbrush – the paint pot split open and hi-def hues escape across illustrator and beyond. Motifs never before witnessed cause havoc with traditional design. If your room doesn’t host then behind you have been quickly left. NuViFloor vinyl floor covering created for impact – both visual and what daily life drops onto it. A textured top layer guarantees hard-wearing, durable performance. The print layer is protected beneath the face – nothing spoils its attractive unique look and it’s built to look good for longer. 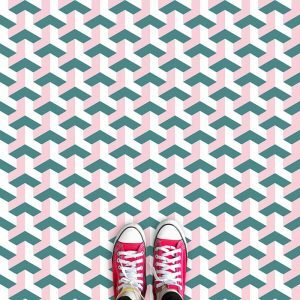 Comfort yourself with the knowledge your home is leading with on-trend geometric design and that you chose the most innovative flooring product available.